3D Printers Canada has a variety of used 3D printers available in stock. For more information on our current stock be sure to contact a representative. Objet30 Desktop 3D Printer - The smallest details create the real design. 3D Printers by Objet - The Objet30 Desktop 3D Printer - The smallest details create the real design. The Objet30 Desktop 3D Printer delivers a unique combination of high-quality, finely detailed printed models available in a compact office-friendly system. Creating smooth surfaces, complex geometries, small moving elements, fine details, stand-out text and whatever else the design demands. Just the solution that companies need to shorten their design cycle and propel their businesses forward, using 3D printers. Based on Objet’s proven PolyJet™ Photopolymer Jetting Technology, the Objet30 creates true-to-life parts of any kind with superb accuracy, for 3D printers. It can build models simply, cost effectively and precisely as you design them. Models produced on the Objet30 are smoothly surfaced and finely detailed; the strong model material and highly accurate printing enable thin walls and small moving parts. The models are ideal for painting, functional, fit and form testing, and vacuum forming. The Objet30 operates as a network printer, allowing multiple designers in the office to send their files to be printed. The 300 x 200 x 150 mm (11.81 x 7.87 x 5.9in) build tray enables large models or many small parts to be built simultaneously, saving time and cost. The Objet30 is small and lightweight enough to fit in any office, on a desk or with the stand Objet offers with the printer. It uses sealed 1kg cartridges of resins and the printed models are fully cured on the build tray. Excels in printing exceptional detail by combining thin 28μ layers with a very small drop size and a high resolution of 600 x 600 dpi. Printing more in less time with the Objet30. Small and lightweight, the Objet30 is a desktop 3-D printer that is perfect for any office environment. 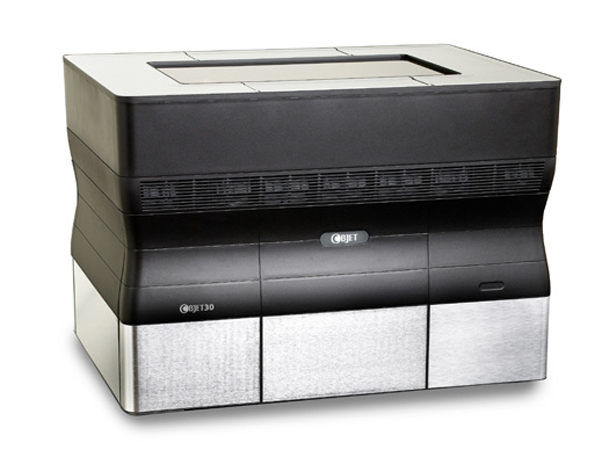 The Objet30 is designed to be easy to use, with simple printer management and operation.